Craftsy ended up using this one for the ‘title page’ of the video (though they photoshopped it into a studio shot of a sketchbook). 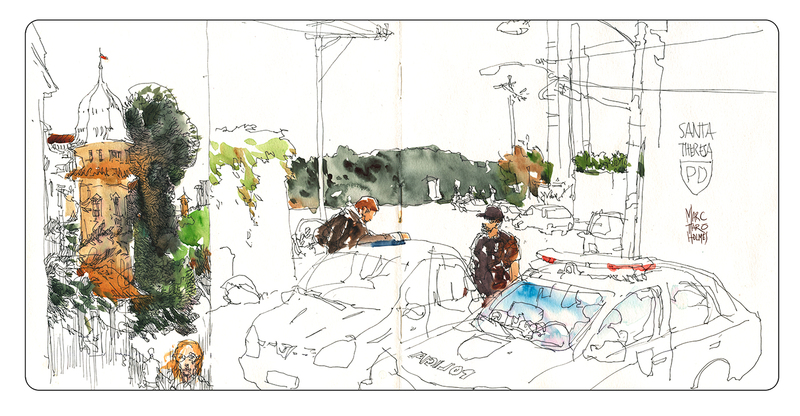 A student recently asked to see the before and after – so here’s the original drawing, made on location, compared with the painting done almost a year later. 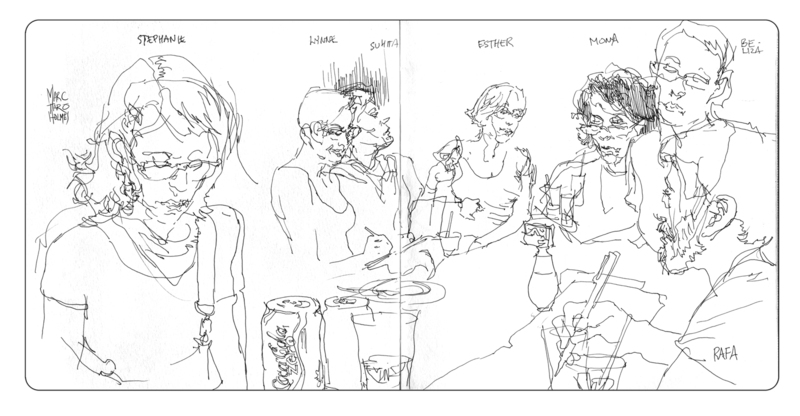 I think you can see my strategy here – The values are clearly established in the drawing – so when I go to color, I’m following the light’s and darks I’ve indicated for myself. And I’m thinking in terms of solid shapes of color. Not floating dabs, or brustrokes – I want strong silhouette shapes. I usually try to paint on location, but at the time I was a bit tired of carrying my gear after almost a week of teaching and traveling. 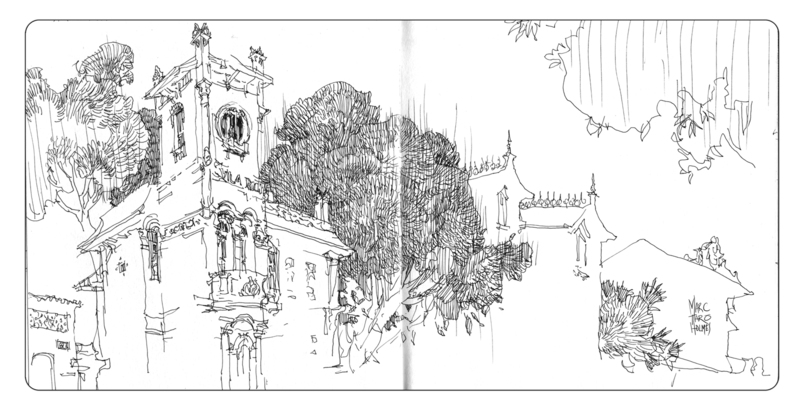 I had just been sketching with Paul Heaston – and watching him produce some excellent pen and ink – I decided to borrow his method, working with just a pen and a lot of cross hatching. It’s quite a relief sometimes to be able to pack light. 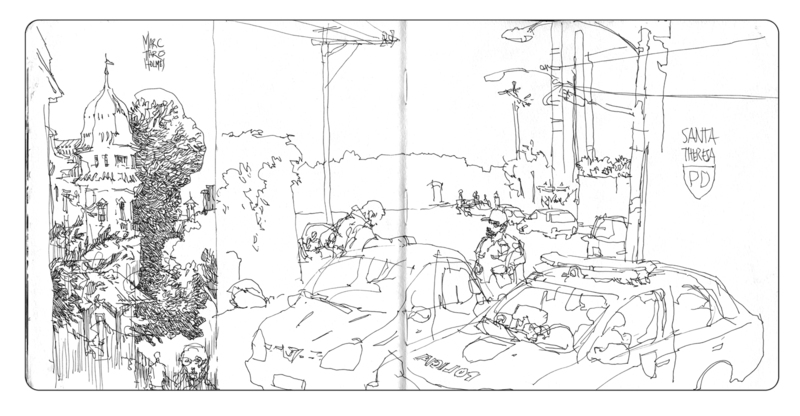 I always liked this sketch – it was Lynne Chapman’s idea to draw this police checkpoint. 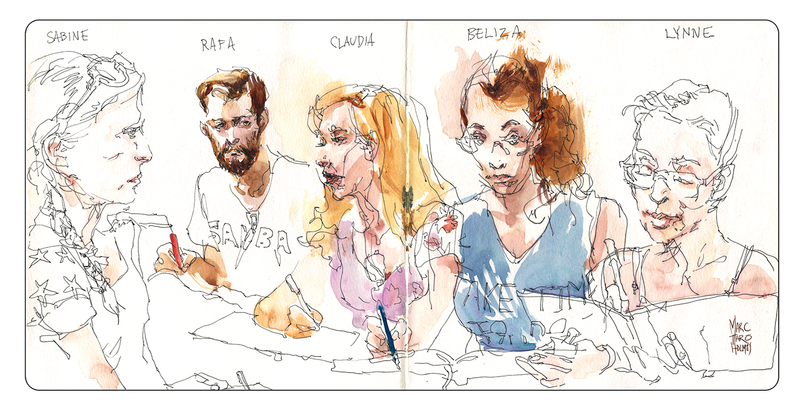 I’m not sure I’d have had the guts to draw them on my own, but in a sketching group you are always braver. The police are everywhere in Rio. I had never seen so many armed cops – it seemed like the police force has to be one of the largest in any city. There were six of them on every street corner where we stayed near Copacabana. I suppose I’m being a typical nervous american tourist – even in Montreal I’m used to seeing cops in groups of four at the metro stations. But still – when walking around, I was wondering – why are they everywhere? Is the crime really that bad? Our friend Rafa said this was a good neighborhood, so we didn’t need to worry – as long as we were out of there by sundown. So – again, normally my advice is to paint as soon as possible after the drawings – the same day if possible, so your memory is fresh. It’s even better to paint right on the spot, so the color will be more true to life. 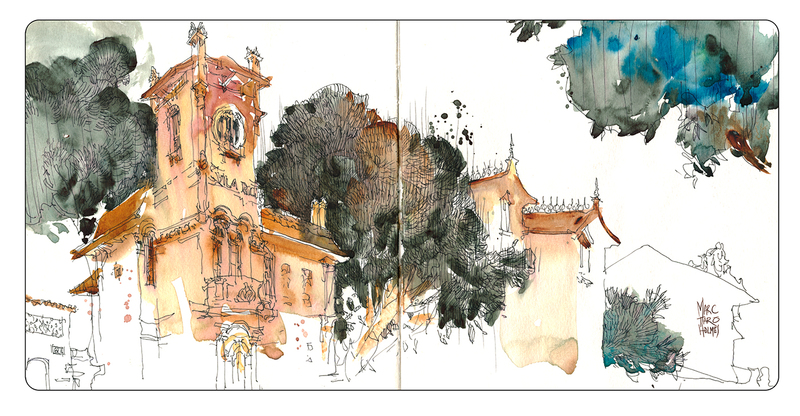 This is some beautiful sketching! I like it. So fun to see these again…your workshop in Brazil was GREAT, you are a natural and gifted artist and teacher, Marc! Hope to get into your workshop in Manchester! 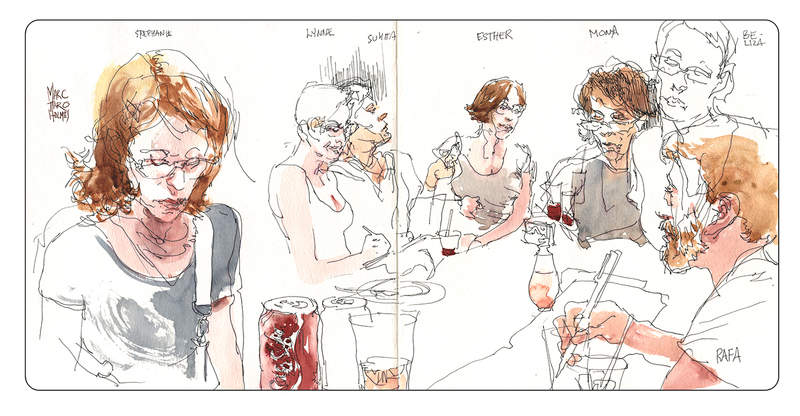 I cannot imagine why you would not be chosen Marc, as an instructor for Manchester.As far as I am concerned, you are the best urban sketcher teacher on line and your courses on Crafsty so inspirational ! That’s been something I’ve been meaning to draw! The great Pantaloons Protest. I hope the don’t resolve their dispute before I get around to that! (Not really, I hope they can get a resolution – but I would kick myself for missing it yes! ).